The vacant lot in the north of Amsterdam where a fully 3D-printed canal house should be standing within three years. In order to do that, the architects bought a shipping container and with the help of 3D-printer maker Ultimaker they converted it into a huge version of a desktop 3D printer. 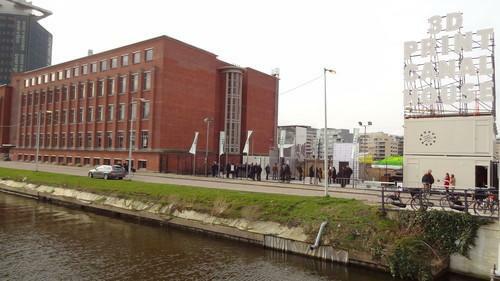 That larger-than-life 3D printer sits on a vacant lot beside a canal in the northern part of Amsterdam. If everything goes well, it will be the home of the first printed canal house within the next three years. The plan is for the front of the house to measure 15 meters high, 6 metres wide and 6 metres deep, while adding a back to the house of the same size if possible within the same time frame. The container-sized printer is called KamerMaker, which is Dutch for "room builder." It uses bioplastic pellets of a material called Macromelt that is based on rapeseed oil. It was developed by Henkel, a company based in Düsseldorf, Germany, that manufactures adhesives for the electronics industry, said Hedwig Heinsman, co-founder of DUS architects. Macromelt can easily be shredded and reused when a piece doesn't come out the right way, she said. That is convenient because the first blocks probably won't make it to the house, said Hans Vermeulen, one of the other co-founders. The first blocks are meant to be test pieces to learn where the faults in the construction of the blocks are, he said. A 3-meter high block currently takes about a week to complete. "Eventually, we would like to be able to finish one within two hours," said Vermeulen. The 3-meter high block being printed Friday indeed showed errors when it was only a couple of centimeters high. The printer did not always manage to spread the Macromelt evenly, making some of the ribs of the honeycomb structure of the block uneven. Those errors eventually will be straightened out in a printed block and don't really affect the strength of the structure, according to Vermeulen. "Maybe in three years we will have printed the house four times, upgrading the house based on the gained knowledge," he said, adding that printing a house is still a process of trial and error. DUS architects is planning to finish the first of 13 planned rooms this summer. Meanwhile, the site will remain open to the public during the building process and those interested can take a look around for €2.50 (US$3.45).